Well, it’s been a busy few months so I thought I would update you all on what’s been happening both on and off the lanes. After being in pain for 15 months I had back surgery 3 weeks ago. I had bowled in a league with my dad for years but I was physically unable to bowl this past season. I had to give up playing golf too, which I love doing as much as bowling. So I got the surgery done and hopefully I will be able to start bowling again about the time the fall leagues start. I can’t wait! I have been coaching in a local Saturday morning youth bowling league for the past several years. I love working with new bowlers, especially youngsters. I love seeing their faces light up when I am able to help them and they start bowling better and enjoy this great sport even more. This past February I studied for and attained my Level I Coaching Certification. I am very proud of this accomplishment. Bronze level certification will be the next challenge! 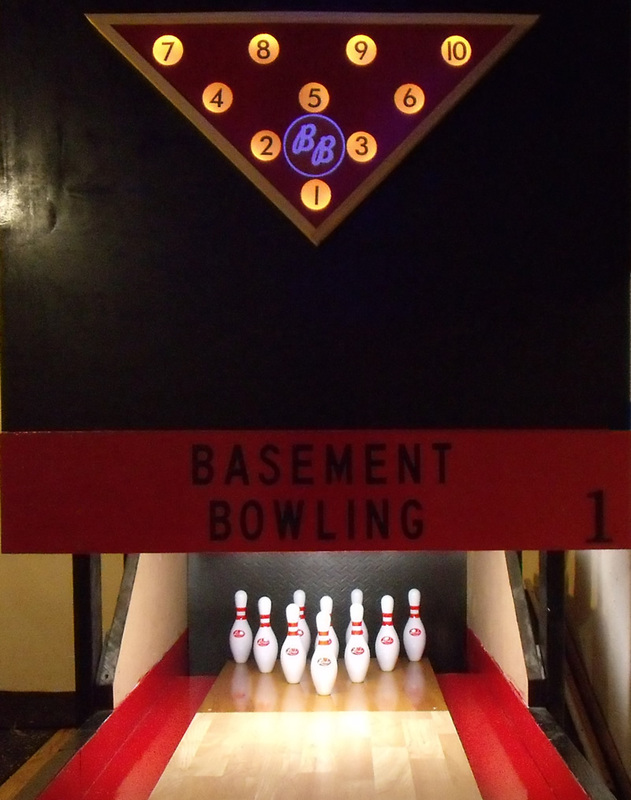 On the Basement Bowling front, I have made some more modifications to the pinsetter and hope to get a video up here soon. 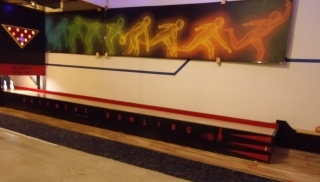 I’ve also made some new contacts with some great people over at the forums at one of my favorite sites, www.bowltech.com. There are a lot of other half-scale nuts like me over there 🙂 and we are working on some exciting things together. A special shout-out to my buddy Jimmy for the unbelievably cool things he is working on. That guy is a genius. I am also still working on the FAQ. There were hundreds of questions in there, many of them repeats, some of them funny and some of them down right strange 🙂 so I am cleaning those up and answering all of them that I can. That’s all for now. Thanks for reading and I will be back soon. I am going to do my best make more regular updates on here. It’s tough because I haven’t done many changes to the lane of late, so I feel like I don’t need to post anything. But I still get over 500 people per week checking on me so I feel that I owe it to them to do a better job. I DO have more ideas that I am wanting to implement and I also have ideas for the website as well. On that note, I just updated the back-end of the website (or is it the pit area of the site?) and just realized that I wasn’t getting notified when someone posted a question in the FAQ section of the site. Well, I just found the questions and there were over 100 of them! I used to have the FAQ area updated but I lost it all and was lazy about re-doing it. I will be posting many of the common questions and updating the FAQ here soon. On a personal note, we have moved around bedrooms, re-painted, and have the nursery pretty much ready to roll (leave it to me to work a bowling term in for that!) Our son will be here in a little over 2 months. Anyone know where I can get some newborn bowling shoes? I would like to wish everyone a wonderful holiday season. Please keep your messages and updates coming. I love hearing about your projects so please keep me updated. I can’t believe a bowling session has ended and another has begun since I last made an update to Basement Bowling. And Twitter? Well, I’m afraid my wife and daughters are even a bit disappointed on that score. I haven’t been able to make any updates to the lane like I had hoped. We’ve been fairly busy with other projects around the house. Funny how that works, huh? I must admit I’m most proud of my recent work: We have a new bowler on the way due February 29, 2012! And this time daddy is getting a boy! 😉 I have three girls. My oldest prefers the basketball court to a bowling lane. (Which incidentally happens to be another passion of mine.) My youngest two girls are both avid bowlers and recent soccer enthusiasts. I’m hoping with the boy I’ll be getting both a bowler and a golfer. Then I will be complete in living vicariously through my kids. Ha! We’re still bowling. Leagues are going on right now, as many of you know. My girls finished 3rd in their division the first session. My youngest wowed us with bowling her first turkey for a 181 score this week. The reactive ball we picked up for her has helped tremendously. She’s got quite a hook. She also qualified for the Pepsi tournament again this session. This makes her third trip. You can imagine how proud I am. I feel I owe you an apology for not doing a very good job of staying current with the site. I think the site getting hacked took the wind out of my sails for a bit. I have kept all of your emails with questions you have been asking about my lane. I appreciate your not giving up on me and I will get around to getting our FAQ back up with answers to your questions very soon. In the meantime, feel free to drop me a line or two in the comments and let me know what you’ve been working on. Feel free to send me any photos you have to include in the gallery I’m starting to showcase your lanes. It’ll be interesting to see the variants in materials and lane design. Just send your photos to me at chad [at] basementbowling [dot] com. Thanks! No, I didn’t misspell “pit”. 🙂 “PTI”, as in ‘pardon the interruption’. Unfortunately the site was hacked and we were down for a bit. Many thanks to my wife/techie guru for helping me get the site back up and running. Unfortunately we were unable to recover the Guestbook and FAQ pages so I will be starting those over. I’m trying to stay positive and look at this as a sign of how popular the site is, but it makes me sad that people feel the need to do such things. I uploaded a new video to YouTube. This one shows an entire 10 frame game, condensed down to around 5 minutes. The video will give you a good idea of the authentic pin action we get on our lane. In other updates, I completely tore out the pit and made some changes.Â Before, the ball and pins would all lay in the pit together.Â Now, the pins fall through the pit and go to a collection area behind the pit.Â Why did I do this?Â Â I have redone the pinsetter so that pins can be pre-loaded into the table while it is raised and they are automatically released and spotted when the table is lowered.Â I didn’t want to have to reach into the pit and pick up pins while having to worry about a bowled ball coming into the pit.Â Now, as the pins get knocked over they slide back through an opening in the pit that is wide enough to allow the pins through while not allowing the ball to go through.Â So now, we can simply retrieve the pins out of the collection area just behind the pit and load them up without having to worry about the ball hitting you.Â The pins are also much easier to get to now, they end up right behind the pit wall instead of having to reach over the back of the pit wall to get them.Â I cushioned the pit board and covered it in black nylon so that the pins would slide through easier. Â I’ll take some pics and post them up soon. Thanks for reading, and thanks for sending me your questions, comments and conversations. I’ve been pretty busy on the lane lately. Some stuff is noticeable and some of what I have been working on is behind the scenes. I added some new vinyl lettering along the sidewall of the lane and at the bottom of the masking unit. I have also been working on redesigning my pinsetter. Pinsetter version 1.0 has served us well but I am working on a major improvement. I’ll have more on Pinsetter 2.0 at a later time. That’s right. I just uploaded 2 new videos on YouTube. The first one is a just a video that shows the lane length-wise from the side. It shows off the new sidewall letters and the remote controlled lighting I installed. The second one shows the new and improved ball return. The original ball return didn’t really work for me. The plastic track was too narrow and fragile. 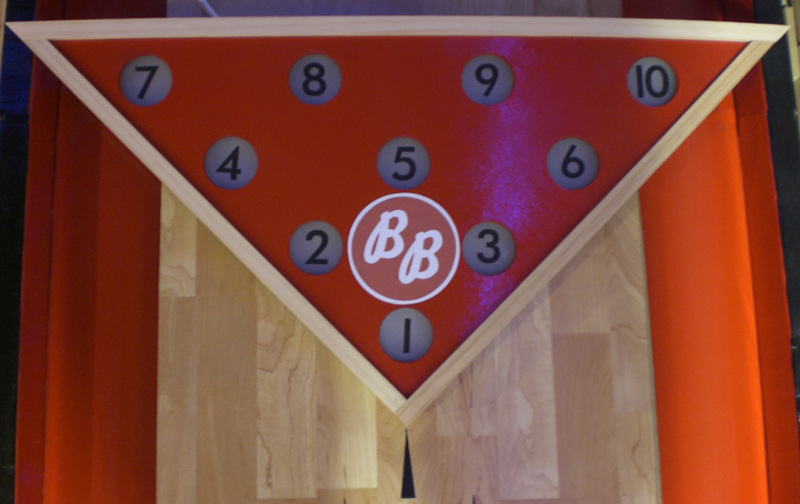 The new return has two 3/4″ round pvc rails that allows the ball to roll back to the bowler as smooth as silk and the ball cannot fall off the track. The orange paint on the rails glows under blacklight and is a lot of fun. 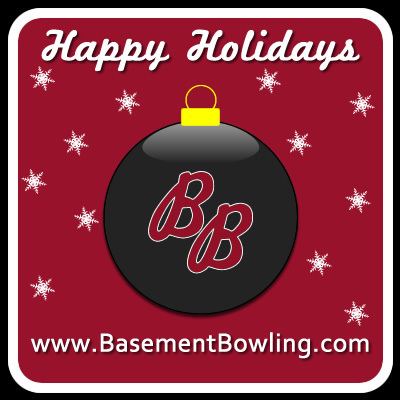 Thanks for reading and keep those questions, comments, and bowling project updates coming. 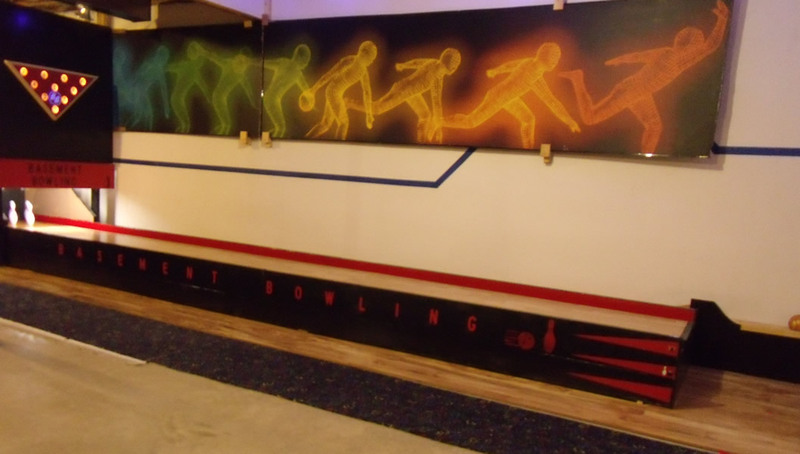 If you read my history page, you will know that I grew up bowling at the local lanes with those AMF Magic Triangle ModIV masking units with those light up Pindicators that told you what pins were left standing. I decided to design and build one of those for my lane as a tribute. I still have to finish the actual wall of the masking unit but the Magic Triangles are complete! Now mine aren’t an exact copy of those (no first and second ball or strike indicators) but they are very similar, with some individuality and personality mixed in. Here’s how I made it. The outside frame is made of pine 1x2s. I routed a groove on the inside of them that is wide enough for the MDF and acrylic sheet to slide into. The red you see is 1/4″ MDF with a couple coats of red paint and a couple coats of polyurethane. The acrylic sheet rests just behind the MDF. I searched for the right font and tweaked it a bit (to try and match the original Pindicator font) and printed the numbers on self-stick clear matte paper and stuck them on the front of the glass and behind the MDF. I used a 6 foot rope light inside and I took another piece of 1/4″ MDF, painted the inside white (to make the inside lights a little brighter) and attached it to the back of the unit. Finally I printed my Basement Bowling logo on sticker paper and stuck it on the front. Done and done. I also wanted to let you know that I added 3 new pinsetter pics to the gallery. 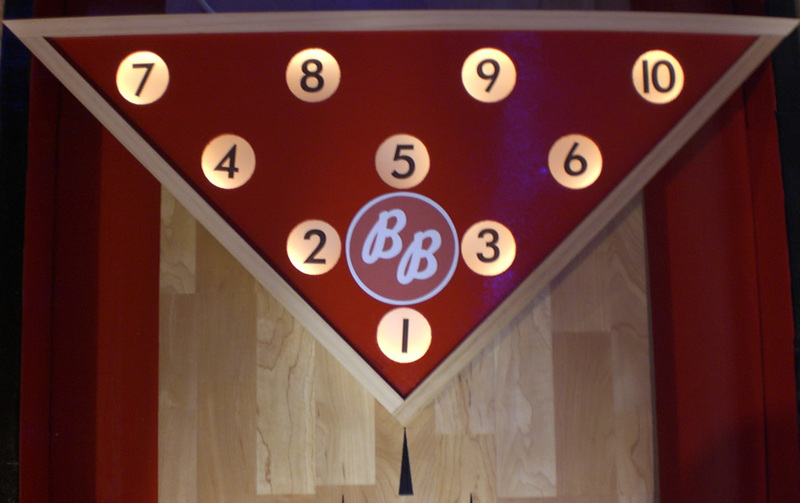 It will give some more detail about my previous blog entry about the pinsetter. It works pretty well but the track is a bit narrow so I had to put guides on each side of it to keep the ball from falling off the track. It works pretty well but I am not happy with it aesthetically and I have had to make some adjustments (the ball was wanting to come off the track near the ball return rack). If you look in the video you can see how the ball actually wore some paint off the wall at the front of the return rack. I have since made the adjustments but since it is so tight where the return is (between the side of the lane and the wall) it is a pain to try and get to it to make adjustments, so I am redesigning it. The new design incorporates side-by-side 3/4 inch PVC pipes spaced farther apart than the current narrow track is. This will eliminate any chance of the ball falling off to the side and will eliminate the need for the guides and will look much nicer and perform better. I also had some issues where a bowler who rolled the ball really hard would sometimes have the ball rebound back onto the lane. I have restructured the pit floor from being perfectly flat to having a decline. I also took out the super-thick cushioning at the back pit wall that was also contributing to the rebounding of hard shots and made a new pit curtain out of a heavy duty rubber mat that should work much better. I will post pics when I get it all finished. Here is the new YouTube video. A special thanks to my film crew (my daughters) for helping me record the videos. Also, my apologies as my camera is having problems with recording sound. So long for now bowling fans.